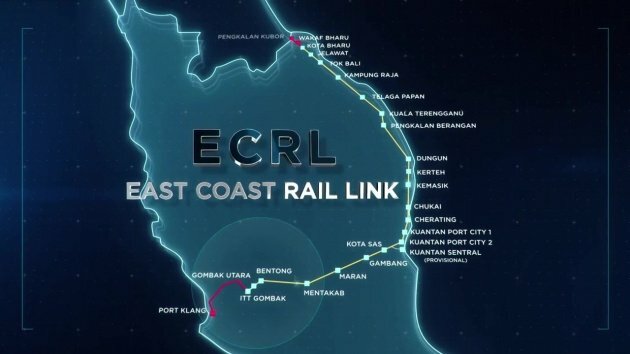 The proposed East Coast Rail Link (ECRL) project has been shelved due to Malaysia’s need to manage its finances, according to prime minister Tun Dr Mahathir Mohamad. In reports by The Edge and The Star, the premiere said the Chinese government has been made aware of the decision, and that it understands the financial woes currently facing the current administration. “I believe China itself does not want to see Malaysia become a bankrupt country,” Mahathir said. Even so, he stated that the government would have to provide compensation on the cancellation of these projects, which will be negotiated at a later date. “This is due to the stupidity of the previous government,” commented Mahathir. Initially, the railway was to consist of two phases; Phase 1 with 21 stations along a 600.3 km line, connecting Kota Bharu in Kelantan to the Integrated Transport Terminal Gombak (ITT Gombak) in Selangor – a future interchange for the Kelana Jaya LRT line – and Phase 2, which comprises 88 km of combined track from Gombak North to Port Klang, and an extension link between Kota Bharu and Pengkalan Kubor. Previously, the project was under review by the government to ascertain not just the construction costs (said to be RM80.92 billion) but also the viability of maintain the rail network. The latter, as explained by finance minister Lim Guan Eng, was estimated to be RM600 million to RM1 billion annually. This the best news for me this Raya Aidiladha although lost huge sums of cash in AQRS shares. Dannng! This thing is waste of money. Build more Universities in the country. We lack education. This is why majority always go to Kesas to rempit. they got no goal in life. I agree. My late brother was a doctor and use to tell me that during weekends the most admissions to the hospital was motorcycle accidents. He used to ask, “Kenapa adik merempit?”, you know what he answered, “Pasal rumah sempit”, Big family and a small flat! what do we expect them to do? Agree. My ex high schoolmate was a NGO volunteer for street vagrants in 2015. She used to ask a kakak, “Kenapa hidup tersepit?”, you all know what she answered, “Pasal salah pemimpin yg kaki kepit”. Yup. Previous government is stupid. We need 3rd national car when 1st and 2nd are still nowhere near the top recognized international brand names. 3rd car can work if you get China workers to work in the 3rd car plant. The problem with Proton, all the workers relax and lepak and half the time tuang kerja. How do you expect it to succeed? That it was, until now…. This shows China cares for Malaysia. Instead of punishing us, they know we are suffering because of previous corruption. Thank you China for caring for Malaysia. You really do understand how corruption has affected us badly in the past. LOL China isn’t very happy with the cancellation la! You believe that old liar ka?? China basically said screw you, you wanna cancel it, you pay for compensation. I don’t care what pitiful stories you’re telling, a contract is a contract LOL…. Why laugh out loud? We and our children are and will be paying for the unseen cost including your good self. Better pay compensation that would be much lesser than the actual amount. Like you said, a contract is a contract. So, better pay less than pay more. Nothing to laugh about. In previous gov, we pay less and get more. In New gov, we pay more and get less. China have to save not only Proton but even our energy companies, rail companies and so many other companies. I agree with this. Certainly they have more refined and smarter bodek-ers whom are very convincing in their arguments as compared local bodek-ers such as one above who lazily copy-paste his bodeks, while assuming we cannot see through his multitudes of name change. I suggest PH to replace their bodek teams with China mari. They will get their money’s worth looking at such poor results above. This is truly the best ever quote I have ever heard. We can say the same for the current gomen as well. Most stupidest gomen in the world. Not stupidest. Most belakang pusing, uturn around and around, making & breaking promises, Government. I voted PH not for their promises or manifestos. I voted PH to kick a corrupt Government out. I am happy for PH to take even 1000 days instead of 100 days to keep their promises. Such a well paid mahacai. Good boy! Yes they did. Economics experts have estimated that Mahathir’s projects costed us RM500 Billion in clean losses. With him back with his voracious ‘appetite’, we can expect more of the same losses but much sooner than before. Better prioritize LPT3 connecting Kuala Nerus–Kota Bharu, easier for Raya balik kampong tmr..
Kawans now got Protiga to play play with. No problemo. P3 is Proton. Same same. Geely demanded Kawan vendors to reduce prices by 30%. All of them will run away to Protiga, leaving only capable ones in P1. P1 will be cleansed of ur Kawans. Ha ha ha. Loki dah bongkar Kawan AES adalah kroni BN. Semua wang(129 juta) dah masuk poket Kawan BN. poor john, now no more money. That is why you are commenting so much here. U still havent tell me where ur showroom is. I wanna come buy brand new Camry for Rm60k like u claimed. Come i gip u sales. Mana u? 1) What is john having money got to do with you? If you lacking, go work. 2) Why you personally attacking john? I hope we keep PT clean without any personal attacks and contribute healthy car matters. This is a car site. It is not a john modal or old employer site. You want to talk about john modal or old employer go to that site. Here we talk about cars (& motors). You decide to buy a car, the bank loan is approved and is being disbursed, and then you decide you don’t want that car anymore, and the bank says that you still have to pay a hefty sum anyway (which, for most people, it would make more financial sense to continue and not cancel it). But you go ahead and cancel it anyway, and have to pay crap loads of money to the bank while getting nothing in the end except for the satisfaction of getting rid of the car. Great work? Maybe for the low standards of Mahacais, it is..
deswai pipu now choose to sambung bayar. when you decide you don’t want that car anymore. Nothing in return even after pay compensation right. That’s the reason why Tun M say “..stupid government”. It’s a difficult decision to cancel the project. Especially ECRL. The other pipeline project, nothing to salvage anymore 80% payment out and built up very small, so decision is easier to made. Cut it so no cost over run effect. ECRL, as I read, there is studies made to simplify or scale down the project to keep it going and reduce the cost. But we don’t have info so there must be something that helps the cabinet to decide to cancel rather than delay it. I agree. The corruption in past 4 mths outweighs all those purported done in last 15 years. Did China rejected his overtures to invest in his new national car project, which drove him to cancel ECRL? It is already ongoing so for him to make such drastic decision must meant that he was rebuffed rather hard. We are so happy we don’t have a korup Gomen and korup Cybertroopers anymore…oh wai! Poodah! Who says got no money? Got so much money to subsidise AES lawbreakers and make new national car again. Stop the spin la! If you believe that statement, then most likely new national car is a flying unicorn with a magical wishing granting horn. Stop dreaming, reality is P3 will screw us again like so many-many of his other projects. Aiyoh, Ahmad Shabery Cheek said (in 2017) ECRL will bring cheaper seafood to KL wor. So ex-Minister, how lah? My kembung fish not gonna drop below RM18/kilo lah. Our car prices are expensive because last time our Government was kotor. Changed gomen ady. So why Camry prices haven’t drop to RM60k like you claimed? Where’s your showroom so that we can buy brand new Camry from you at your quoted RM60k price? Don’t run away when you see us yea. I oso want to buy new Camry from u at Rm60k. Where ur showroom ah? I think PaulTan should blacklist and ban this Haris that post such a rubbish useless comment!! Even at USA the Camry starting price is around USD$24k, Langkawi and Labuan no tax Camry also above RM100k. Abesla Toyota salesmen! Now all Malaysians will invade Toyota showrooms nationwide demanding for new Camry at Rm60,000. If this proves to be a lie, then Toyota will double abesla for having their member lying to the public. this is the stupidest assumption made by a stupid people i ever read. LOL. sekolah sampai darjah berapa je ni? 63 years we have suffered with corruption. Now we are heading for better times. Cannot recoup the cost. You think those poor kampung Trengganu and Kelantan people can afford RM300 ECRL ticket? OMG That’s a big joke, you must crawl out from some caves. Express bus tickets to East coast are sold out in every peak seasons. You said they cannot afford it? Huh? Kelantan and T’ganu people can’t afford the ticket? I guess you didn’t know that the ECRL’s primary strategic value is for logistics and freight, not for passenger transport? Yg bodoh memang bodoh… no cure.. I second that! ECRL, Hambantota & Djibouti port semua for logistics and freight too.. But PH the one turning that into reality. I was waiting for a High Speed Train. Anything faster than the antiquated Diesel powered train to go back to JB. The highways are usually jam packed with cars and high probability of accidents. Now cancelled. I was also waiting for an East coast train link to the without having to pass through Gemas. Now cancelled. So what is the New Govt proposals? Expand the hiways or make new hiways to ease the congestion? Give us facts not crap. No more U -turns, please. Gemas-JB electrified double track will be completed by 2022, so by then you don’t have to use the old Diesel trains. ECRL not viable (and very expensive!!) as the main reason for building it is to connect Port Kuantan to Port Klang for cargo shipments. The Chinese gains more from the project. What U-turns?? The review and cancellation of these mega projects (ECRL, HSR) were part of their manifesto LOL. Rakyat memilih mahukan yg lebih baikkk tapi…. Then Anthony Loke says ECRL will postponed like MRT3. Don’t know who to believe in this new Government, really. Ohmai.. pilih PH nak hidup lebih baik, tp jadi lebih teruk. Keretapi semua batal, kereta nasional baru pula dipaksa beli dgn naikkan harga kereta honda toyota.. The government now scrapping the ECRL project, but on the other hand, went on to approve Penang LRT project, which is RM46 billion for the Penang island. So what is this? The LRT, together with a monorail, cable cars and water taxis, is part of the state government’s RM46bil Penang Transport Master Plan (PTMP). LRT for one state is Rm46bil. Train thru 4 states is Rm55bil. Something seriously wrong with Pakatan calculation there. Seems like we are paying more for less!!! !